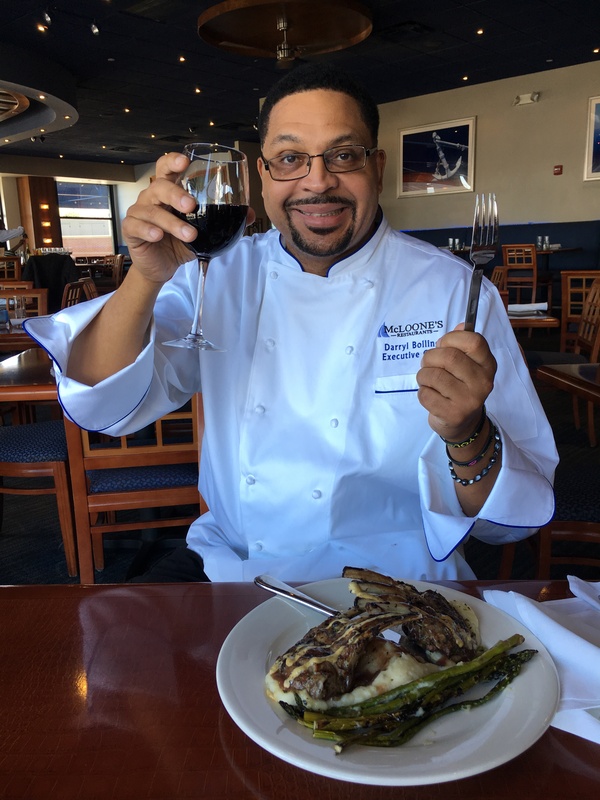 Chef Darryl enjoys his succulent Rack of Lamb with mashed potatoes and grilled asparagus. What inspired you to pursue a career in the culinary field? My love and passion for food and people. Food is universal and can bring people together from all walks of life. Everyone needs food, and there’s no denying good food! Cooking allows me to play a role in bringing people together. Who or what has made the biggest influence on you during your career? Mike Bomberger, he was the epitome of “if you can’t stand the heat, get out of the kitchen”. Early in my career he was considered one of the toughest Chef’s to work for, but I learned a lot from him that I still carry with me today, such as flavor profiles and the distinct way that I prepare my dishes. What is your “personal favorite” dish on your menu and why? Rack of Lamb, it’s a French cut rack served on a bed of mashed potatoes and asparagus topped with a red wine demi glaze. The meat is succulent and tender, and the red wine demi glaze enhances the natural flavors of the meat. What sets my cuisine apart from others are two special ingredients called “love” and “fun”. Food isn’t hard….people make it hard. I like to smile, laugh, and enjoy what I do and I honestly believe that that transcends into my cooking. When you indulge in a Chef Darryl dish I want you to taste the love and fun in every bite. My guilty food pleasure is pasta.